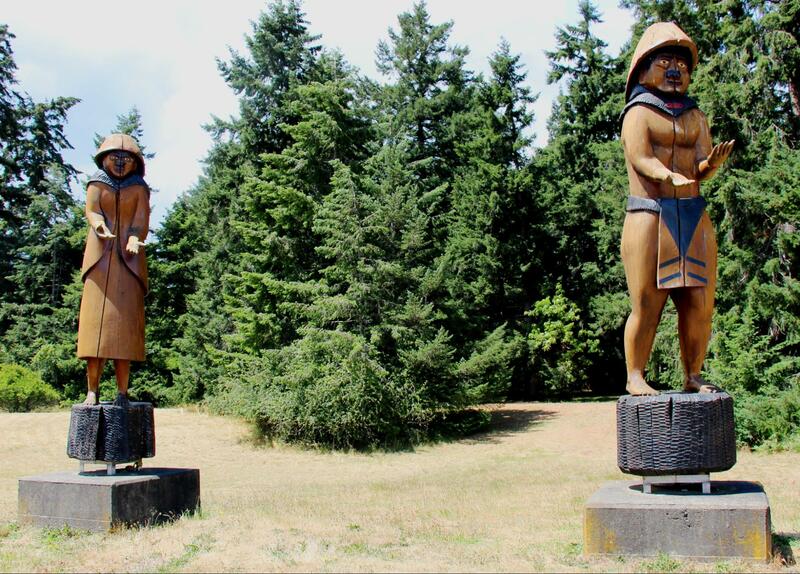 In the Pacific Northwest, the totem pole is something that most travellers — and many residents — admire, but may not truly understand. These totem poles, created by First Nations carvers, are not just unique works of art, they are stories and markers. Each one is a symbol of family history and ancestry, representing a tie to the land and resources. First Nations have long passed on knowledge from generation to generation through oral traditions, which includes storytelling. Totem poles were the traditional way of telling the story of an individual clan and to communicate legends, history and culture. 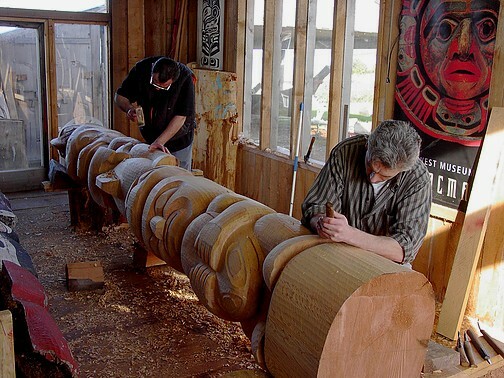 Every totem has a distinctive story and can be grouped into specific categories; categories depend on where the totem will be located and the occasion for which it is carved. Welcome poles were traditionally placed on village beachfronts to hail visitors. Today, contemporary welcome poles can be found at significant sites where visitors are welcomed onto First Nations land, into museums and at significant sites. Inside the homes of high-ranking chiefs is where house poles were found; family history was carefully carved into each pole. Memorial poles stood in front of a house and depicted special accomplishments or events in the life of the deceased’s family. Mortuary poles were different altogether, holding the remains of the deceased and carved for anyone with a high ranking in a community. The poles were inverted to provide more space at the top and a cavity was created; the remains were placed inside. Many of these poles can still be found in various locations on the west coast but there is one pole that can now only be found in a museum — the shame pole. Traditionally carved for a chief who wished to humiliate or ridicule another, often a rival, the shame poles represented the subject in an unflattering stance. When the wrong was made right, the pole came down. natural world — bears, fish, wolves, whales — are commonly present on the poles; as are mythical supernatural creatures, like the thunderbird or sea serpent. Often, one specific creature is represented on the pole as the First Nations family crest. This crest is usually passed down from generation to generation but can also be inherited through marriage, acquired by conquest of an enemy, or appropriated by another family. This family crest often appears at the top of the totem pole. Memorial totem pole on Namgis burial grounds at Alert Bay. Totem poles can also include ceremonial and everyday objects that indicate a family’s social status or legends that are central figures to the totem’s story. These poles often depict a family’s status in the community, their origins and lineages, rights and privileges, supernatural experiences, territories, marriages and memorials. A totem pole is a complete family history, created to last eternity. 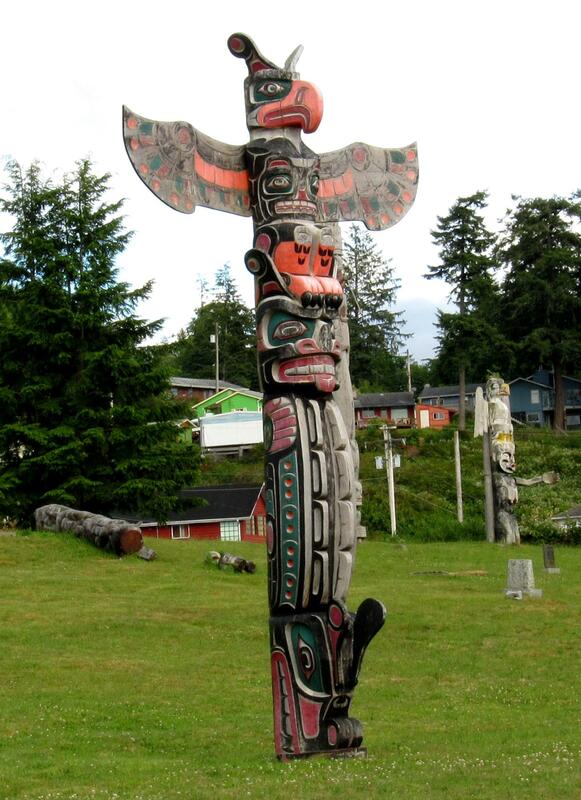 When a totem is complete, the raising of the pole is cause for celebration that includes a potlatch. Attendees from near and far converge followed by several days of festivities. 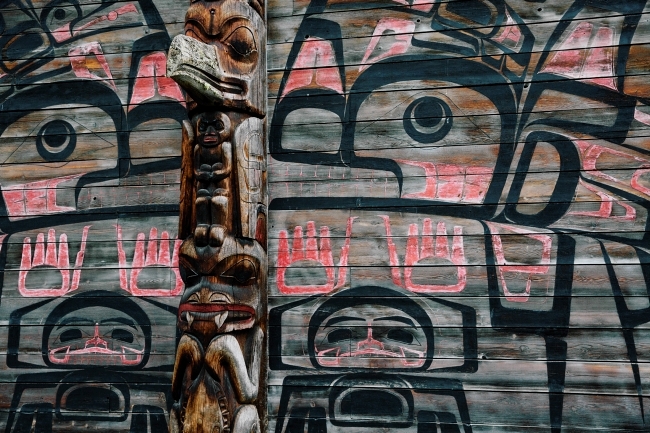 The Canadian government banned potlatches in 1884, and a period of totem poles being bought and stolen by collectors from all over the world followed. At the same time, traditional carvers were passing away without sharing their expertise with the next generation. This resulted in the near extinction of the art of totem pole carving by the 1950s. The staff of the Museum of Anthropology at the University of British Columbia understood the significance of the looming disappearance of totem pole carving. In 1950, the museum commissioned Mungo Martin, one of the last master carvers in the Pacific Northwest at the time, to replicate old and decaying totem poles. That foresight, combined with a lift on the ban of potlatches in 1951, saw a revival of the art and a new generation of carvers taking on assignments, including the replication of older totems that were disintegrating with age and weather wear. This cultural tradition gained more momentum in 1966, when the provincial government celebrated the 100-year centenary uniting the colonies on Vancouver Island with the rest of British Columbia. 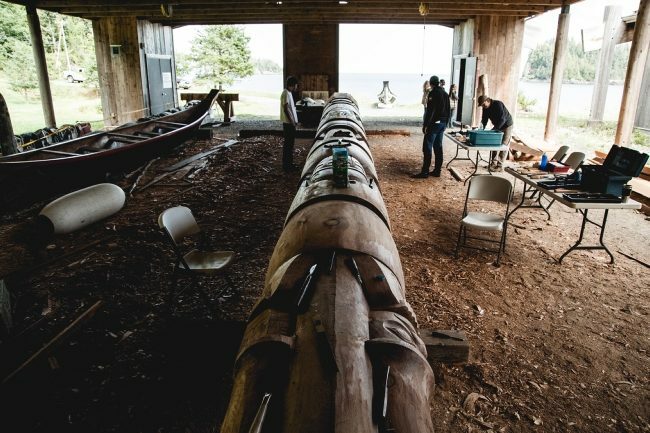 As part of the commemoration, 11 First Nations carvers were commissioned to create 19 totem poles that would form a new “Route of the Totems.” These totems would act as markers for the land and water route from Tsawwassen, on the mainland, to southern Vancouver Island and up to Prince Rupert in Northern BC. Many of the carvers were the last generation of traditionally trained First Nations artists in their communities, the poles becoming last remaining vestiges of their work. The start point for Duncan’s Totem Tour. 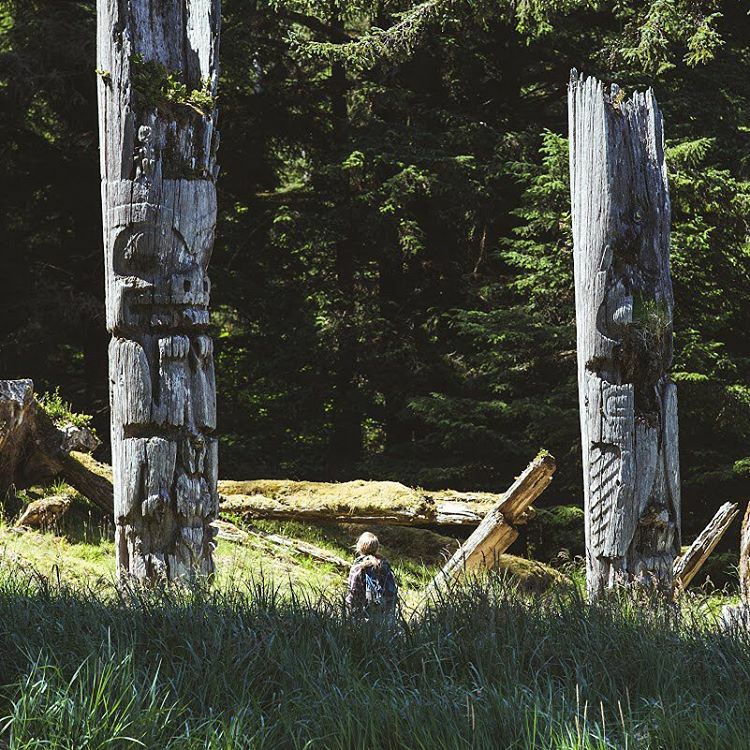 Many poles along the Route of the Totems are still in place today and communities across BC raise traditional totem poles on the land as a sign of respect to our First Nations. 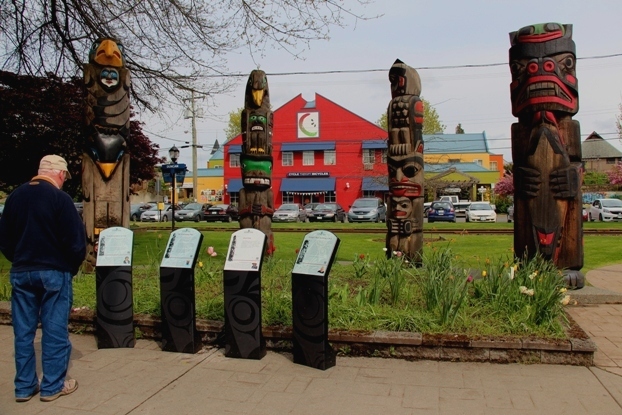 The City of Duncan, now known as the The City of Totems, has realized the important cultural history embedded in totem poles. They have created a walking tour of the downtown core, taking visitors on a journey to view 39 totems created by various Aboriginal artists in diverse styles. In the remote community of Alert Bay stands the tallest totem pole in the world at 53 metres (173 feet), and the Namgis burial ground is home to many totems in varying stages of decay. Allowing totems to return to the earth from whence they came is tradition. 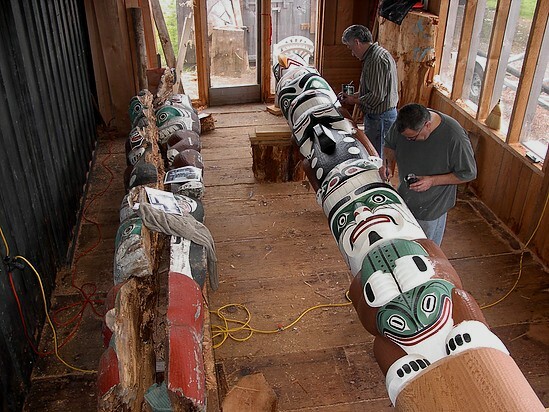 Today, many decaying totems are refurbished or replicated in an effort to keep the stories that are carved into them alive. Totem poles are not simply unique works of art, they are stories. Stories that link First Nations with their past and represent their future. A true testament to the resilience of the First Nations in British Columbia to keep their culture and traditions alive.